I’m happy to announce that the first paper using Galaxy Zoo 2 data was submitted (to MNRAS) yesterday. In this work we used an early look at the information you have provided us on the presence of bars in a sample of GZ2 galaxies too look at trends of the bar fraction (basically how likely a certain type of disk galaxy is to have a bar) as a function of other properties. Examples of barred (top) and unbarred (bottom) galaxies from Galaxy Zoo 2. In doing this research I’ve learned that bars are really interesting features in disk galaxies. Unlike spiral arms, which are density waves (meaning stars pass in and out of them over the life of the galaxy), the matter in bars (stars and gas etc) actually rotates with the bar. This means that the bar breaks the symmetry of the disk of the galaxy and causes transfer of material both in an outwards along its length. What it boils down to is that bars should have a significant impact on the internal evolution of a galaxy. They have been suggested as a way to build some types of bulges, as a way to fuel star formation in the central regions, and perhaps even fuel AGNs. At the outer ends, the bar can induce ring like structures (see the top middle example) – and might even be responsible for driving spiral structure. So what did we find? Well we observed a strong correlation between the bar fraction and the colour of the disk galaxy. Redder disk galaxies are much more likely to have bars identified by GZ2 users than bluer disk galaxies. 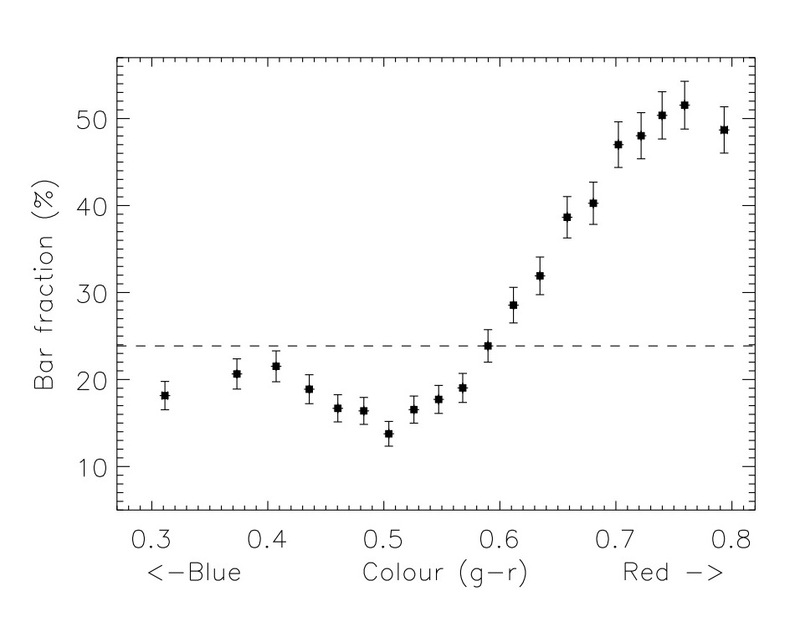 Bar fraction as a function of galaxy colour. The dashed line shows the overall bar fraction for the whole sample. We also tried to split the sample by the size of the bulge. We find that disks with large bulges (shown by the red line below) have high bar fractions, and that disks with small bulges (shown by the blue line) have low bar fractions. This split by bulge size also splits the disks into things which are mostly red (large bulge) and blue (small bulge) – as illustrated by the histograms of the colour distribution of the two types of disk galaxies. What’s new here is that we show this also correlates strongly with the presence of a bar. Top: bar fraction as a function of galaxy colour split into disk galaxies with large bulges (red) and small bulges (blue). The dashed line shows the overall bar fraction for each sub-sample. Bottom: histograms showing the colour distribution of the disk galaxies with large bulges (red) and small bulges (blue). So we seem to split disk galaxies into two populations – ones that are red, have large bulges and are very likely to have bars, and ones that are blue, have small bulges, and are not so likely to have bars. This gives an overall picture in which bars may be very important to the evolution of disk galaxies – perhaps more so than has been thought before. It’s very interesting, and I look forward to spending more time with barred galaxies and with the rich data set that you have given us with Galaxy Zoo 2. We’re already working on more results from the bars using Galaxy Zoo 2, so expect updates soon. Also I just saw some very interesting results on bar lengths using data from the (now completed) Bar Drawing project. Hopefully we’ll have a paper from that soon too. Stay tuned! A very interesting paper, Karen. I look forward to learning more about your project. It’s nice to figure out how we help and be a super-tiny part of it all. Congratulations for your paper. I have research experience already! Yay! lol And we all get listed (probably in very small hardly readable print some obscure place)! We are still in there! Of course, all we did was classify galaxies for an hour and they did hours of research. Anyways, good luck on your paper Karen! This project is totally wicked! Thanks for the link and this info. This is so exciting! I’m happy to participate in this worthwhile project. I had fun doing my bit and my high school students were involved too. It is great to be part of a real life project which can produce real science. Well done all. congratulations to you all for bringing the clicks around the world to reality through your paper. Congratulations Karen on your scholarly analysis. Now we know where the bars are if we get thirsty on our inter-stellar journeys. Seriously am impressed by your work. Best wishes. Thanks for giving us the opotunity to help you in this fun research. May your science ever be clear of bias. My clicks will be the best I can do for you and the rest of the zoo team. It is great to be able to contribute in even a small way to something as great as this. Well done Karen and to all involved. The sky’s the limit! Good luck in future research. when accepted, it would be possible to have it posted entirely in the web? Ana – it the paper is available on the web already in the astroph archive, as linked from a later blog post.